BoFs: The BoF sessions are always a very important part of the Akademy experience. This is where actual work gets done, and where plans are forged. I'm involved in running three BoFs this year about KDE documentation, one about the supporting membership program, and a session about KDE e.V., which the board would like to use to answer questions about KDE e.V. and discuss what people expect from KDE e.V., and how we can improve and excel. They all will be interesting and I'm of course looking forward to attend some other BoFs as well. Meeting old and new friends: KDE is an amazing community. Akademy and other meetings always feel like meeting friends, even if you haven't ever seen the other people before, and maybe just exchanged a couple of emails. So I'm looking forward to meet older gentlemen as well as the young and wild new members of the community. 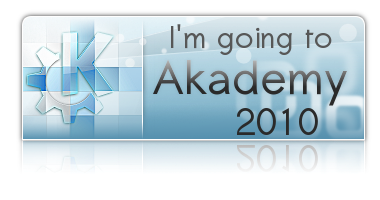 Thinking future: Akademy always is a place to think about the future of KDE, of our community, our software. This year this is particularly interesting. There are a lot of interesting developments, be it on the hardware side, where devices which could run KDE software are becoming much more diverse, or be it on the software side, where web applications and the associated technologies, or new platforms like MeeGo or Android are having lots of momentum. So I hope we can have some serious and creative discussions about how and where KDE can find its place in this universe today, and in the coming years. Our potential is huge, bit we also have to make use of it.